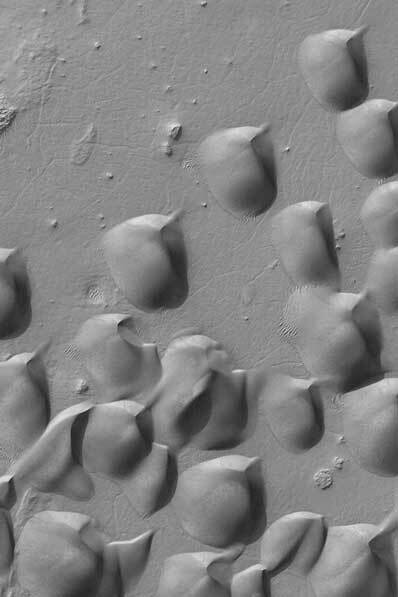 NASA's Mars Global Surveyor in orbit around the Red Planet has captured this view of the Wirtz Crater sand dune field. Scientists say the shape of the dunes indicates that wind has been transporting the sand from the southwest toward the northeast (lower left toward upper right). The picture covers an area about 1.9 miles wide and is located near 48.6 degrees South, 25.5 degrees West. Sunlight illuminates the scene from the upper left. Malin Space Science Systems and the California Institute of Technology built the Mars Orbiter Camera on MGS using spare hardware from the Mars Observer mission. MSSS operates the camera from its facilities in San Diego, CA. The Jet Propulsion Laboratory's Mars Surveyor Operations Project operates the Mars Global Surveyor spacecraft with its industrial partner, Lockheed Martin Astronautics, from facilities in Pasadena, CA and Denver, CO.